No word of a lie, my goal now that I'm in my final home is to touch every card that I own and determine if it fits in with my collection. There's going to be a lot of cards that will have to go (probably to a worthy store for donation), I'm also putting together my first box to send to COMC to sell (there are a ton of inserts/parallels that I own that aren't needed), and a third pile that has started are sets that I would like to build/complete. So far, I've found 4 sets that I'd really like to build and have in my collection. They may or may not make sense from where you sit, but I'd like to have these in some binders and put away to look at in the future. Also, there's no real hurry now to complete anything new that I add to the want list, because I probably will not be putting a lot of money into my collection for the foreseeable future. Funny how a new house changes your priorities, huh? But for now, enjoy my babbling about these 4 sets and let me know if you think I'm crazy for wanting to add them to my collection. Although the Night Owl ranked this 37th in his countdown of top 50 Topps sets of all time, I like this set better than some of the ones he ranked ahead of it. 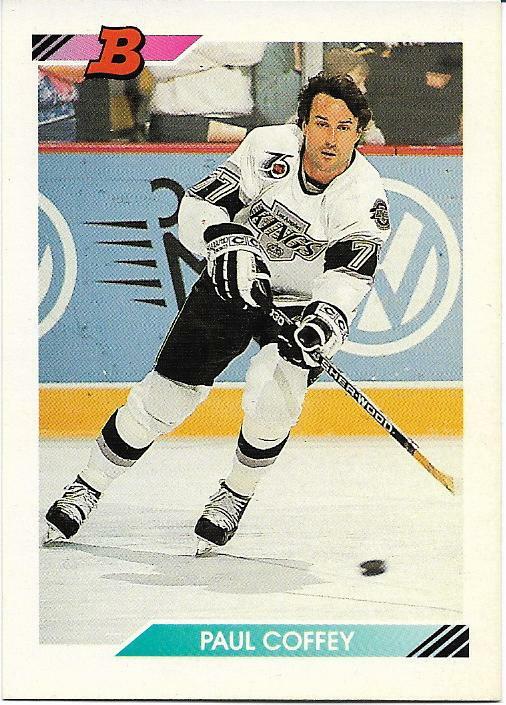 While the Jim Clancy you see here is a prime example of the blurry photos that the Owl talks about, the hockey stick design is a lot better than many of the others in the 80's and 90's. So far I've only located 18 cards from the 792 card set in my travels, I'm sure that I'll find some more once I've touched all my cards. 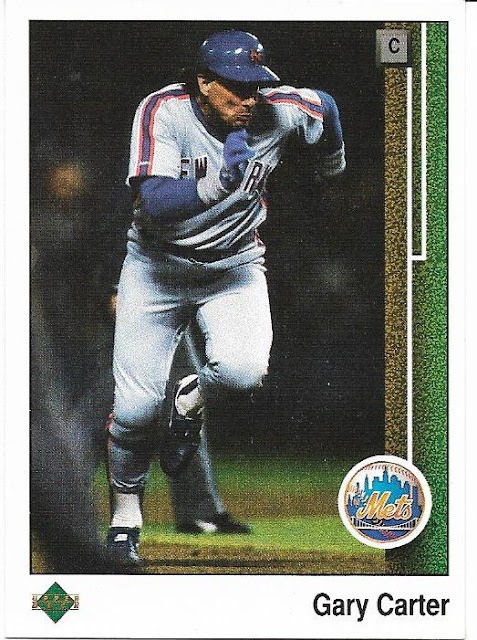 Plus, the only card in the set that's going to set me back any kind of $$ is the Ripken RC, so this set shouldn't do a lot of damage to my wallet. I've false started on this set a couple of times, wanting to put it together but then finding other sets or projects that I wanted more. In the early 90's, I'm of the opinion that this set was the only real competition for the next set that I'm going to talk about. I remember the hefty price of packs when this came out ($3 was unheard of and scared off a lot of collectors); by the time series 2 came out, the buzz had subsided somewhat since UD packs were still a $1 and the quality was pretty much the same. I have just 16 of the 528 cards in this set so far, another number that I believe will increase by the time I get my hands on everything. 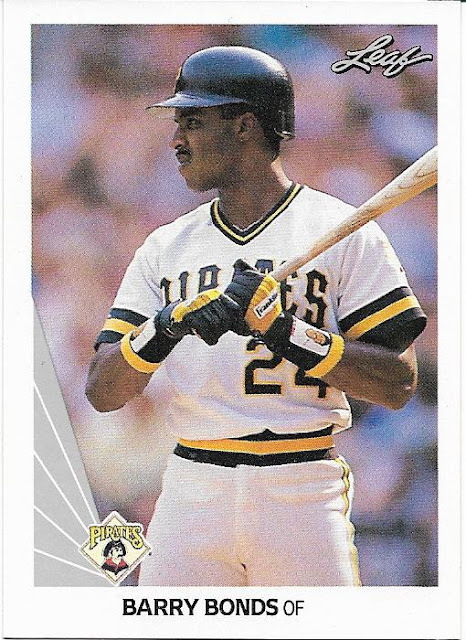 The rookies are going to be fun to hunt down, as there are some good names in the '90 set, such as Frank Thomas, Larry Walker, Sammy Sosa and John Olerud. Still, I'm sure that there enough of these commons lying around in peoples commons boxes that I should have no trouble finishing this off. I got back into collecting a year after this set came out, and I should have put it together then, instead of waiting several years then being scared off by the high prices that the Griffey Jr. RC commanded. 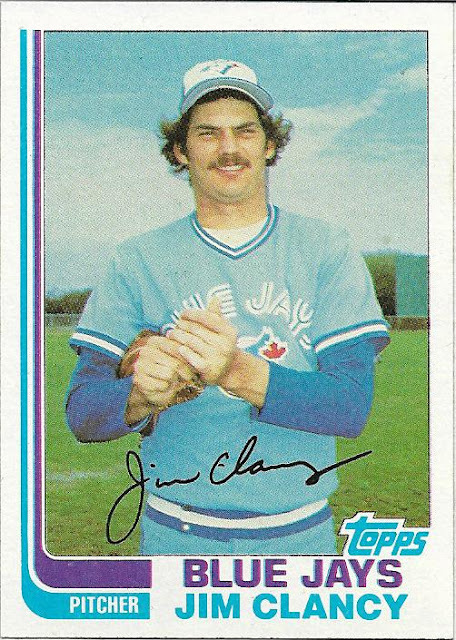 I have 34 of these cards right now, again not a big portion of the set, but I'm hoping to be closer to 100 once I've had a look at everything in my stash. The crazy reverse negatives aren't going to be a concern of mine, as I'll just try and obtain the corrected versions (if there any). The reason I put this 4th out of the 4 sets I want to build is strictly because of the foil cards in the set. Pricey enough that I'll be talking my time going after them, this set will probably be the last of these 4 that I'll chase. It's the smallest of the 4 sets on this post (only 400 cards), but when all the major stars have foil cards which are still quite popular with collectors (and sellers), chasing the set piece by piece may get expensive. I still have about a dozen monster boxes to go through, so touching 'em all is going to take some time, but the trips that I'll have down memory lane will be worth it. Almost all of my sets are factory purchases - I was actually thinking of collecting the 1982 set individually as well. I love it - I say go for it! 1982 is a nice set.. I have 31 of them, mainly Jays and Expos..
89 - probably should, but I think UD really got it right a couple years later (1993). I am sure I have a bunch of 89s in my trade box. You are going to get them. 92-93 - Hmmmmm. Let me think about that. Touch-em-all sorting? Sounds like you just read "The Life-Changing Magic of Tidying Up." Find the sets that bring you joy!